At present, there are two ways to produce 99Mo in a reactor: 1) fission process—from U fission product by reaction 235U (n, f) 99Mo and 2) activation process—by radiation capture reaction 98Mo (n, γ) 99Mo. This paper presents the results of experiments performed with molybdenum carbide nano-powder to produce 99Mo. These results show the implementation of the above idea in practice. At present, there are two ways to produce 99Mo in a reactor: 1) fission process—from U fission product by reaction 235U (n, f) 99Mo and 2) activation process—by radiation capture reaction 98Mo (n, γ) 99Mo. The main advantage of 99Mo production from U fission products is a possibility to have large amounts of the final radionuclide 99Mo of a high specific activity (more than ten thousand Ci/g) per one production cycle with practically no carrier. In U fission, the total 99Mo yield makes up 6% in average. At a neutron flux density of about 1014 n/(cm2s), the maximum 99Mo accumulation is achieved in 5 - 7 days from the beginning of the target irradiation. There is only one significant drawback in this way of 99Mo production that is a large amount of radwaste that contains more than 97% of the initial U in the target. The remaining 235U isotopes can be extracted from radwaste for further treatment but this is rather a costly process. The activation process of 99Mo production by reaction 98Mo (n, γ) 99Mo has a great advantage that is practically no radwaste. In addition, when producing molybdenum by the above process, there is no problem with the purification of the final 99Mo from high-active 235U fission product impurities as compared to the fission one. The cost of a 99Mo activity unit produced by the activation process is an order of magnitude lower as compared to the 235U fission product reprocessing. The main disadvantage of this process is the low specific activity of the final 99Mo radionuclide that is several Ci/g. It makes the activation process unsuitable for a commercial production of sorption-type 99mTc generators. When producing 99Mo by the activation process, molybdenum oxide (МоО3) is used as a target, as a rule . The irradiated target is reprocessed by dissolving molybdenum oxide in alkali with further correction of the solution composition depending on the way of the generator production . The solution, along with the final 99Mo, contains a significant amount of a carrier (nonactivated 99Mo and other Mo isotopes if a target was made from natural Mo). In this case, the specific activity of produced 99Mo is about 1-5 Ci/g . The purpose of this paper is to search for a way of selective extraction of final 99Mo from the irradiated target. Molybdenum carbide nano-power was proposed as a target since it has a well-developed surface that can achieve from tens to hundreds square meters per on gram of powder. The particle surface can be considered as a grain boundary that is an extended defect able to accumulate inter-crystalline segregations. Under irradiation, atoms capture neutrons and turn into excited state. Further, during the decay, energy releases that is enough to destroy the chemical bonding of atoms in a molecule. 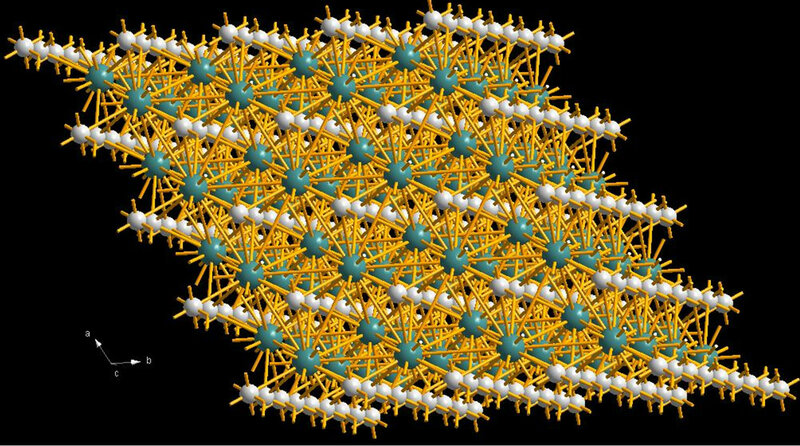 Atoms go out of the crystalline lattice and may come to the grain boundaries. The surface is like a trap for any non-uniform elements of the material base structure. Atoms of non-uniform elements achieved the surface have an advantage from the energy viewpoint since they can concentrate on grain surfaces. In this case, they can be easily dissolved chemically in alkali or acid solutions. For the first time the idea of using nano-powders for radio nuclides accumulation was published in 2006 and patented . This paper presents the results of experiments performed with molybdenum carbide nano-powder to produce 99Mo. These results show the implementation of the above idea in practice. 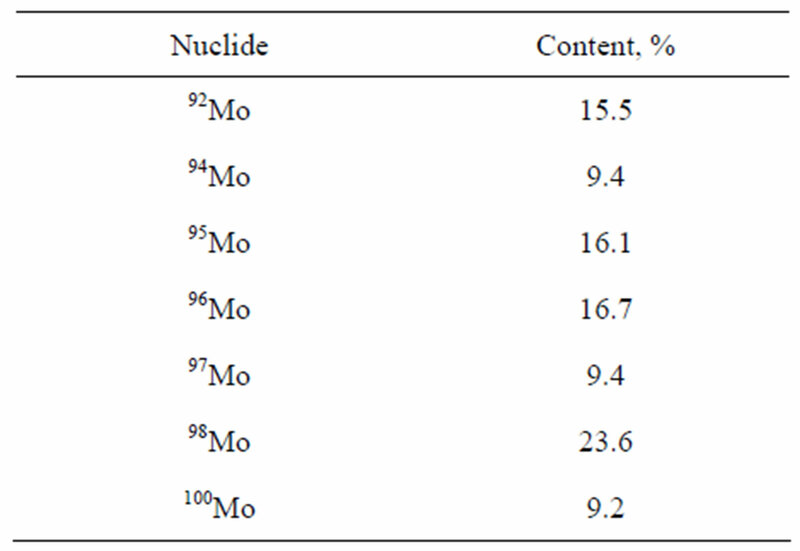 Molybdenum carbide with the natural Mo isotopes content was used, Table 1. Molybdenum carbide powder was examined at the super-high resolution field-emission scanning electron microscope Zeiss SUPRA55VP equipped with energy dispersive spectrometer Inca Energy 350, wave dispersive spectrometer Inca Wave 500 and HKL Electron Back Scatter Diffraction Premium registration and analysis system. We applied some amount of powder (2 - 5 mg) on an Agar electro-conductive band and put it into the microscope vacuum chamber. Figure 1 presents high magnification secondary electron image of nano-powder particles at accelerating voltage 20 kV. Then, we examined separate areas by energy dispersive spectrometer Inca Energy 350, registered X-ray characteristic spectra and analyzed the chemical element composition of these areas. Powder particles were of a globular shape and their sizes varied from 10 to 50 nm. However, the majority of particles was about 20 - 40 nm in size. It should be mentioned that the examination of the chemical element composition of separate nano-powder particles by SEM is impossible since the typical dimension of the X-ray excitation area (about 1 mm) comprising data on the material elementary composition were certainly larger than the physical size of a particle. This area may consist of not only numerous powder particles but also of carbon-containing substrate that makes difficult the evaluation of the real carbon content in the powder. Besides, the evaluation of the carbon content may be affected by the thickness of a carbon-containing film (the same refers to oxygen) that appears on any surface being in contact with air for some time. Table 2 presents the results of the chemical composition examination. The ultimate composition of the nanopowder consists, mainly, of molybdenum and carbon. There can be insignificant impurities of calcium and platinum. Table 2. Chemical composition of the nano-powder. Table 3. Amount of molybdenum carbide powder in capsules. Figure 1. 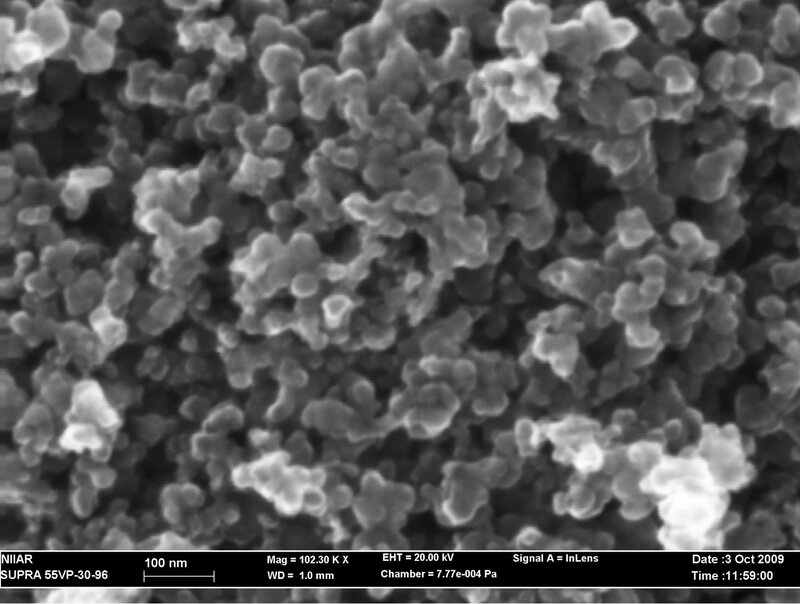 Mo2C nano-powder particles. Figure 2. Capsule (target) design with Мо2С powder. Figure 3. Irradiation rig design. with a specific activity of about 1Ci/kg was accumulated. The Mo activation was calculated at a neutron flux density of 1.16 × 1014 cm–2 × s–1 (Е > 0), 5.17 × 1013 cm–2 × s–1 (Е > 0.1 MeV) and reactor power 6 MW. To calculate the rate of inelastic interaction reactions between neutrons and nuclei, the ADL-3 cross-section library was used. The radionuclide constants were taken from the FENDL-2 data file. 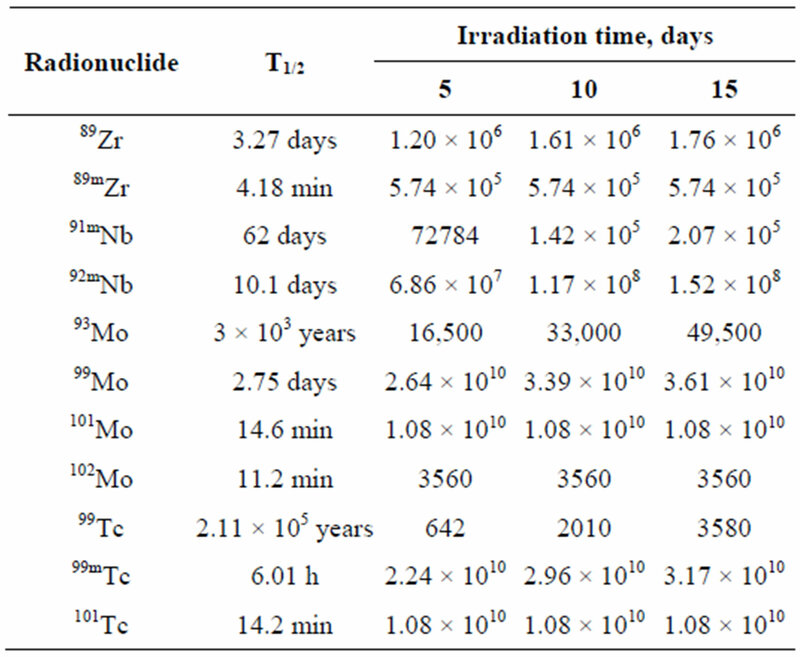 The kinetics of nuclide concentrations under irradiation was calculated by the TRANS_MU code. All the calculation results are in Bq/g unit that is the activity of radionuclide in 1 g of molybdenum at the end of irradiation. 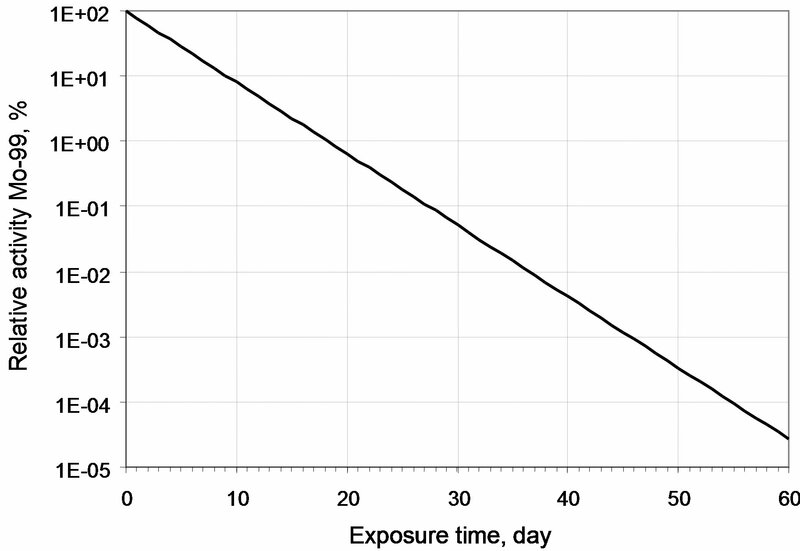 Figures 4 and 5 present the 99Мо decay scheme and its specific activity vs. irradiation time. It can be seen that the 99Mo specific activity becomes practically stationary after irradiation for 15 effective days (97.4% from the stationary value). After irradiation for 10 effective days, this value is 91.7% from the stationary one and it is 71.5% after irradiation for 5 effective days. Since the specific activity of a long-lived 93Мо nuclide increases almost linearly, then, from the viewpoint of a purity of 99Мо generating nuclide in irradiated molybdenum, the minimal irradiation period is more preferable. All radio nuclides involved into the calculations have half-lives less than 1 minute and activity no less than 1000 Bq/g. Their activities are given in Table 4. The relative decrease of 99Мо activity observed during its cooling for 60 days is shown in Figure 6. 99Мо was extracted as soon as capsules were removed from the reactor. The capsules preserved their integrity. Powder Мо2С did not differ from its initial state. It freely ran inside capsules when we overturned them. Close to the capsules, the gamma-emission dose rate did not exceed 1000 mSv/h. Gamma-spectra from the capsules were measured and they showed the dominant presence of 99Мо, Figure 7. The capsules were placed into a glove box and opened. SEM sowed that the size of molybdenum carbide particles remained the same, Figure 8. Table 4. Activities of radio nuclides in irradiated molybdenum, Bq/g. Figure 4. 99Мо decay scheme. Figure 5. 99Mo specific activity vs. irradiation time. Figure 6. 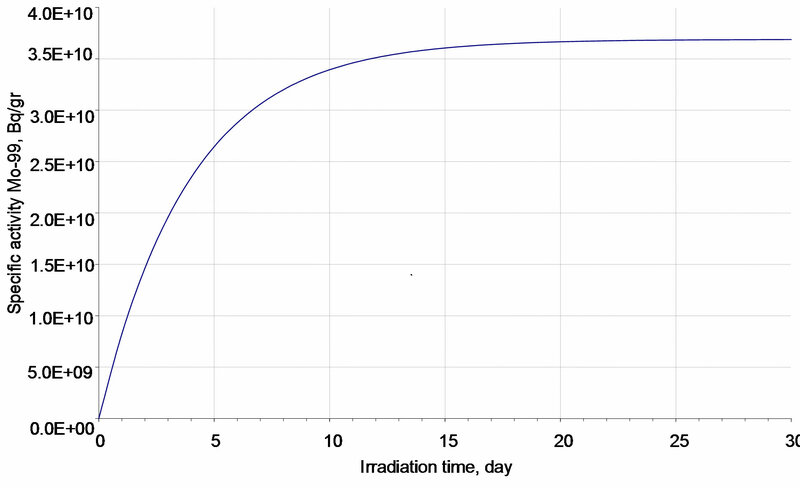 Decrease of 99Mo relative activity after irradiation. Figure 7. Gamma-spectrum of an irradiated Mo sample. Figure 8. Mo2C nano-powder particles after irradiation in RBT-6. times with de-ionized water, the filtrate color being darkgreen. Then, there was one more filtration though the “blue ribbon” filter. The final filtrate volume made up 20.5 cm3. Then, 1 cm3 of filtrate was diluted with deionized water by 10000 times and 50 cm3 of solution was placed into a screw-top plastic glass (Æ40 mm, H = 60 mm) and sent for radiometry. It took ~1.5 hours to extract 99Мо. Table 5 presents the measured filtrate samples activities. Quartz capsule No.4 was opened the next day, on 09. 09.2009. Molybdenum carbide powder was poured into a 5 cm3 test tube through a fennel (visually, almost all powder was removed from the capsule). 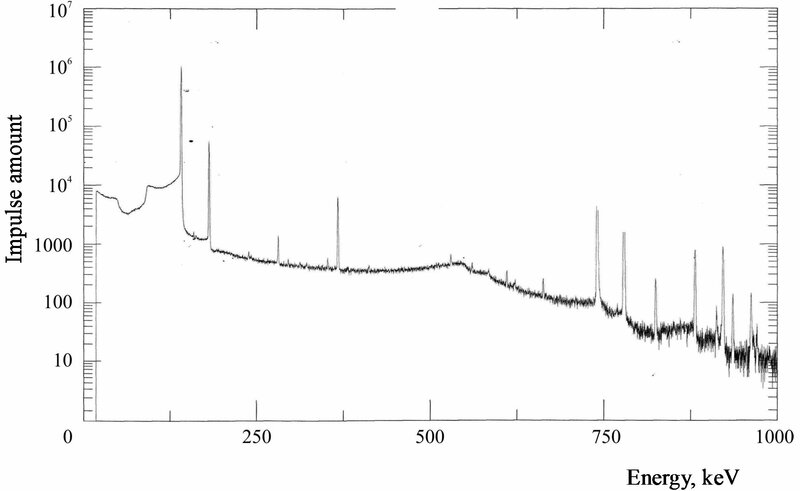 The gamma emission rate from the powder made up ~350 mSv/h. We added 2 cm3 of 0.1 mol/l KOH into a test tube with molybdenum carbide and agitated the mixture for 5 minutes. Then, the suspension was filtrated through a double “blue ribbon” filter into a 25 cm3 volumetric tube. The deposit remained on the filter was washed 5 - 6 times with deionized water, the filtrate color being yellow. Then, there was one more filtration though the “blue ribbon” filter. The final filtrate volume made up 14.5 cm3. Table 5. 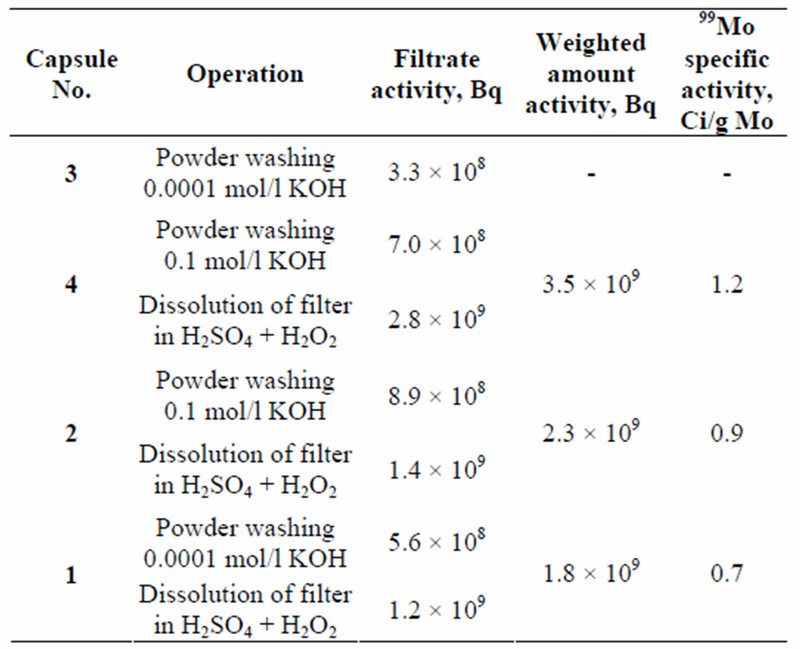 Measured activities of filter solutions and filtrates samples. sent for radiometry. All operations took ~2 hours. The results of the filtrate sample activity measurement are given in Table 5. The activity of filtrates and filter solutions was measured at gamma-spectrometer with an HPGe-detector and DSPECPLUS analyzer (EG&G ORTEC). All the filtrates and filter solutions were measured in the same plastic glasses with covers Æ40 ´ 55 mm; the volume of each solution to be measured was 50 ml. To have a high recording accuracy, the spectrometer was calibrated by means of a certified standard source 152Eu (r = 1.01 г/cm3) for volume of 50 ml. 99Mo characteristics are given in Table 6. The filtrates were cooled for about 1.5 months. During this time, practically all Mo-99 decayed that allowed us to subject these solutions to chemical analysis to evaluate the content of the carrier-stable molybdenum. The analysis was done at the “Spectroflame Module S” ICP fieldemission spectrometer and the results are given in Table 7. The data on the content of stable molybdenum allowed us to calculate the specific activity of Mo-99 (in filtrates) as well as to evaluate the level of filtrates “enrichment” in Mo-99, i.e. to see how much the filtrate activity was higher than the specific of the whole weighted amount. As it can be seen from Table 6, the “enrichment” of filtrates No. 1 and No. 2 made up 1.5 and 1.6, respectively. The “enrichment” of filtrate No. 4 was different that could be explained by the insufficient amount of the washing solution (14.5 ml) as compared to filtrates No. 1 and No. 2 (20 and 25 ml, respectively). So, some amount of Mo-99 could remain in the filtrate. Table 7. Characteristics of Mo2C powder treatment for capsules No. 1, 2, 4. Figure 9. Мо2С crystalline structure. Figure 10. 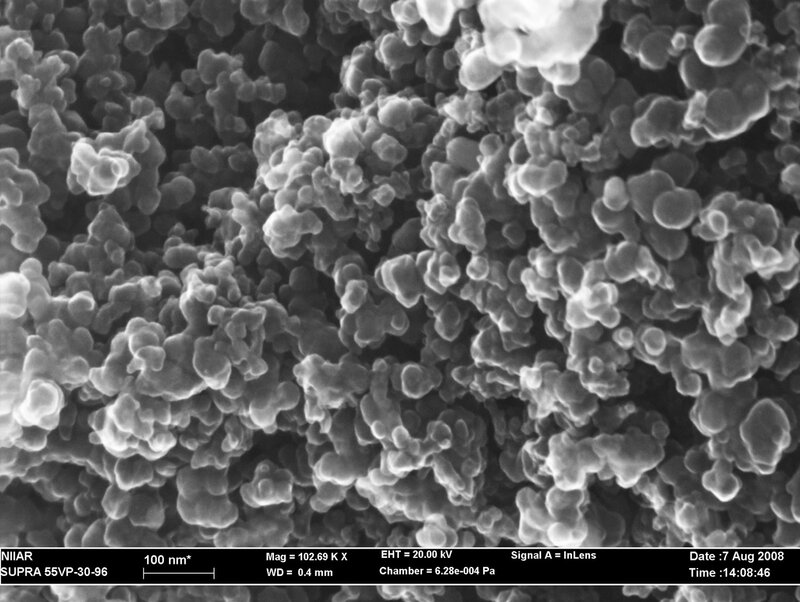 Production of 99Мо from molybdenum carbide nano-powder. cated in layers and come out to the particles surfaces. Under irradiation, the following mechanisms could be considered. As a neutron is captured, a molybdenum nucleus becomes excited and, as a gamma-quantum is emitted, energy starts releasing that exceeds significantly the chemical bound energy of atoms in the lattice. It allows the generated radionuclide to move out of the lattice at a rather long distance. The surface of powder particles is a good barrier (trap), on which radio nuclides escaped from the lattice accumulate. The second mechanism is when near-surface molybdenum atoms capture neutrons. For these atoms, due to self-shielding, the capture rates could be higher as compared to those located at a distance from the surface. The examined molybdenum carbide nano-powder has a very developed surface that achieves tens and hundreds of square meters per one gram of powder. In this case, after irradiation, 99Mo accumulated on the surface can be converted into solution by dissolving a thin near-surface layer about several atom layers thick. The above mechanism is schematically shown in Figure 10. The performed examinations showed that this scheme can be principally used for the 99Mo production. It has several advantages that are, first of all, minimization of waste, simple production operations and low cost. The whole process from the completion of irradiation to the production of solution with 99Mo takes several hours. It is quite evident that the 99Mo specific activity of more than 50 Ci/g can be achieved if we produce Мо2С nano-powder with Mo enrichment from 24.1% to 99% in 99Mo and irradiate it in higher neutron flux (5 - 10 times higher), in the SM reactor, for instance. Such specific activity can be achieved only under irradiation in a high-flux research reactor. It is expected that if the size of molybdenum carbide nano-powder particles and chemical agent is optimized, the extraction of 99Mo from a target by simple washing may achieve more than 40%, the target being preserved and reused. It is expedient to use molybdenum enriched in 98Mo since more pure solution with 99Mo, i.e. less contaminated with other radio nuclides, can be produced. It is known that the following impurities may generate under irradiation of natural molybdenum: 93Мо (Т1/2 = 3.5 × 103 years) from 92Мо converting into 93mNb (Т1/2 = 13.6 years) and then into 93Nb; 101Мо (Т1/2 = 14.6 min) from 100Мо generating 101Тс (Т1/2 = 14.2 min) when decaying and then 101Ru . Besides, 188W (Т1/2 = 75 days) and daughter 188Re (Т1/2 = 167 h) generating 188Os when decaying may be observed in irradiated samples in the form of impurity radio nuclides because of insufficient purification of molybdenum from foreign-metal impurities. E. L. R. Hetherington and R. E. Boyd, “Targets for the Production of Neutron Activated Molybdenium-99,” Proceedings of the IAEA Consultants Meeting, Faure Island, 10-12 April 1997, pp. 19-24. G. E. Kodina and V. N. Korsunsky, “Status and Progress of Application of Tc-99m Radiopharmaceuticals in Russia,” Radiochemistry, Vol. 39, No. 5, 1997, pp. 385-388. M. P. Zykovand and G. E. Kodina, “Methods for 99Mo Production,” Radiochemistry, Vol. 41, No. 3, 1999, pp. 193-204. G. I. Maslakov, V. G. Maslakov and L. G. Babikov, “Production of 99mTc and 188Re,” RF Patent No. 2268516, 2006.